You only need a big room with a table. Focus on eye lines, postures and gestures. Where do people look? What are they doing with their hands? 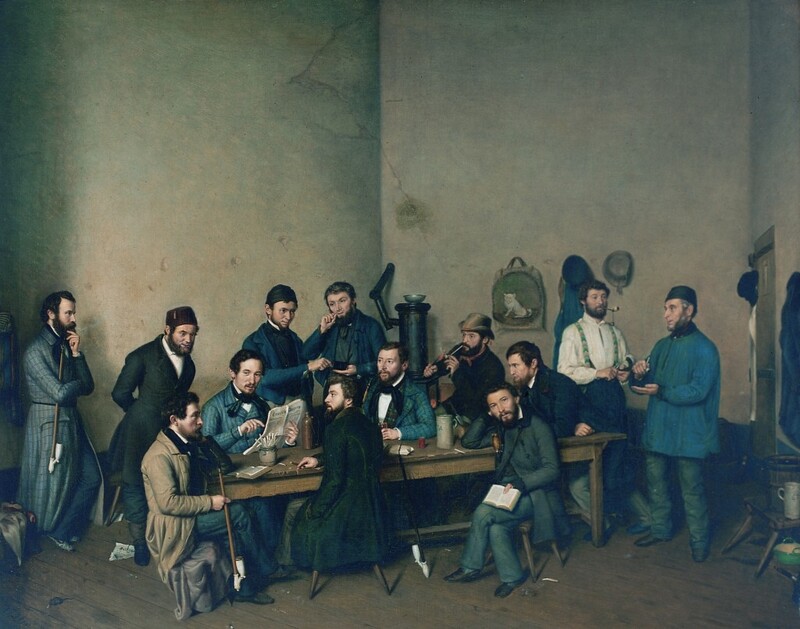 The prison scene by Johann Velten is one of the rare image documents about the events of the Democratic Revolution of 1848 in this part of Germany. The Revolutions of 1848 in the German states, also called the March Revolution, were part of the Revolutions of 1848 that broke out in many countries of Europe and a series of loosely coordinated protests and rebellions in the states of the German Confederation, including the Austrian Empire. They demonstrated the popular desire for increased political freedom, liberal state policies, democracy, nationalism, and freedom from censorship. The middle class elements were committed to liberal principles, while the working class sought radical improvements to their working and living conditions. However, the middle class and working class components of the Revolution split, and in the end the conservative aristocracy defeated it, forcing many liberals into exile, where they became known as Forty-Eighters. The painter Johann Velten was one of the Forty-Eighters. He was imprisoned in 1848 and set free in June 1849. He then painted this prison scene, showing himself standing on the very left and fellow prisoners and rebels around the table. The painting was meant to be a parody, because in reality the prisoners were not enjoying the freedom of reading news papers or smoking or simply gathering in a room for a chat.